Beautiful certificate from the Boston Patriots Football Club issued in 1972. This historic document was printed by Security-Columbian Banknote Company and has an ornate border around it with a vignette of a Patriot Football player. This item has the printed signatures of the Company's President, William H. Sullivan, Jr. and Treasurer and is over 35 years old. This is a transition certificate with a red overprint showing the name change from the Boston Patriots Football Club to the New England Patriots Football Club. this is the first time we have had one with the name Boston Patriots Football Club. Folded from mailing, otherwise excellent condition. Professional football arrived in New England on November 16, 1959, when a group of local businessmen, led by former public relations executive William H. "Billy" Sullivan, Jr. was awarded the eighth and final franchise in the new American Football League. One week later, Northwestern University running back Ron Burton was selected as the franchise�s first draft choice and Syracuse running back Gerhardt Schwedes was selected as the team�s first territorial choice. New England Patriots, professional football team and one of four teams in the East Division of the American Football Conference (AFC) of the National Football League (NFL). The franchise was formerly called the Boston Patriots, the team plays its home games at Gillette Field in Foxboro, Massachusetts, and wears uniforms of blue, red, silver, and white. The team's name was inspired by Boston's role in the American Revolution (1775-1783). The Patriots fielded several strong teams during the 1970s and 1980s, reaching the playoffs five times from 1976 to 1986. Star players during the period included quarterback Tony Eason, tight end Russ Francis, future Hall of Fame offensive guard John Hannah, cornerback Mike Haynes, and linebacker Steve Nelson. Following the 1985 season, the club played in the Super Bowl but lost to the Chicago Bears. In the mid-1990s, New England again became a powerhouse in the Eastern Division. It won the 1996 AFC championship and then lost to the Green Bay Packers in the Super Bowl. The Patriots finally triumphed in their third Super Bowl visit, defeating the favored St. Louis Rams in 2002. 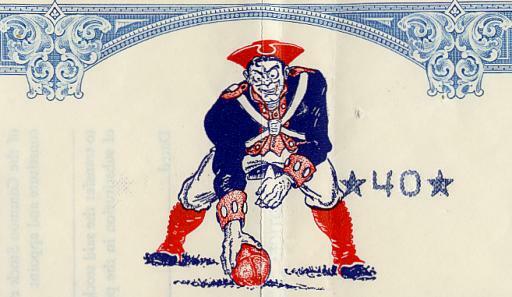 The Boston Patriots joined the American Football League (AFL) as a charter member in 1960. In its second season the team compiled a winning record. Eleven Patriots played in the 1963 AFL All-Star Game as head coach Mike Holovak steered Boston to a tie for the Eastern Division title. The team boasted many stars, including linebackers Tom Addison and Nick Buoniconti, wide receiver�placekicker Gino Cappelletti, running back Jim Nance, and quarterback Babe Parilli. The Patriots struggled from 1964 to 1969, posting winning records in only two of six seasons. In 1967 Nance received the league's most valuable player (MVP) award. The club joined the NFL in 1970, establishing its home in Foxboro. Because the team played its games outside of Boston, the franchise was renamed in 1971 as the New England Patriots to appeal to a greater number of fans. The Patriots had a slow start in the NFL, winning no more than seven games in a season from 1970 to 1975. New England made a remarkable turnaround in 1976, finishing with an 11-3 win-loss record and earning a wildcard berth to the playoffs under head coach Chuck Fairbanks. The team starred Russ Francis, John Hannah, Mike Haynes, and Steve Nelson. In 1978, led by second-year quarterback Steve Grogan, the Patriots won their first NFL Eastern Division crown. In the early 1980s, however, New England again dropped to the bottom of the division.